New Stratfor files released in my partnership with Wikileaks below the fold! Dear US and EU citizens: Don't let your politicians fool you now with #Syria's chemical weapons like they did with #Iraq and WMD scam! In the Village of Now there once was a young boy named Jimmy that thought it was fun and games to run out of the woods crying "wolf," so later, when Johnny came running out of the woods with a nasty bite on his thigh and blood streaming down his leg, crying "wolf," many on the Left said "remember Jimmy? ha ha!" Not only did they refuse Johnny any first aid, they completely ignored his wounds in their efforts to imply he was lying about the wolf. This is the position being taken by many on the Left today when imply that concerns expressed by Obama and others that Bashar al-Assad may use chemical weapons against his opposition in Syria are echoes of the false charges made by the Bush and Blair governments against Saddam Hussein in Iraq a decade ago. They ignore the inconvenient fact that Assad has already killed tens of thousands of Syrians in the past two years and is currently killing hundreds everyday. They don't catalog the weapons he is already using to slaughter Syrian civilians, including artillery barrages, sniper attacks, shahiba, cluster bombs, barrels filled with explosives, white phosphorus, incendiaries, helicopter gunships and napalm because acknowledging any of this undermines their thesis that it is all a Western excuse for intervention and there is no real danger of Assad slaughtering even more Syrians with chemical weapons. In short, for their claims to even past the smell test, they have to ignore the rotting bodies in the streets of Aleppo and Damascus, ignore the reality that Assad is already killing civilians, it would seem, by any means possible. If there is any doubt as to whether on not Assad has or will use chemical weapons, they insist that the benefit of the doubt be given to Assad and not the people he is murdering. Yes, we know they threw us a "Curveball" on the question of WMD in Iraq. Yes, we know that claim was completely fabricated. Does that mean that every such claim is a false claim made for nefarious purposes? Maybe they're just thinking about how they will look if they don't say anything and such an attack does come. 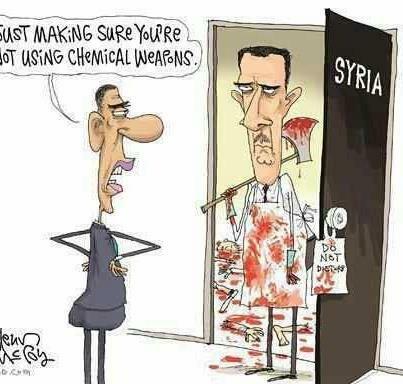 Nobody is saying they will definitely take military action if Assad does use chemical weapons. The claim that we were in imminent danger from Hussein's WMD was just a phony excuse for the invasion of Iraq. The West has a history of making up causes for war out of whole cloth. I document in Vietnam: American Holocaust how the Gulf of Tonkin Incident, that was used to justify the sending of a half million US soldiers to Vietnam and the slaughter, by the US, of at least three million Vietnamese, was fabricated by LBJ's White House. Published on the website last week in response to the Syria chemical weapons talk, rings false. It sounds to me pretty much like the propaganda that was used prior to the invasion of Iraq, where the chemical weapons were held up as an excuse to bring about Western intervention, ultimately, when it wasn’t true. Of course, Democracy Now is merely repeating here what has become a virtual mantra on the Left as to Obama and all's warning to Assad not to use chemical weapons, but there are at least three things wrong with this proposition. 1.) The unmentioned fact that Bashar al-Assad has obviously adopted a murderous policy of punishing the civilian population in opposition areas and causing massive civilian deaths with everything in his arsenal, including napalm cluster bombs, except for the chemical weapons that his government has acknowledged they possess. Civilian deaths are not "collateral damage" they themselves are a means to an end. Perhaps that is always the case. But today, in Syria, the world is tolerating it even when it is naked and open as never before. 2.) 42,000 dead is insufficient pretext? Firing numerous times into Turkey, a NATO partner is insufficient pretext? Firing into Jordan, Iraq, Lebanon, even Israel is insufficient pretext? Political violence and assassination in Lebanon is insufficient pretext? Half a million refugees forced to flee the war to neighboring countries is insufficient pretext? Napalm cluster bombs and white phosphorus on civilians insufficient pretext? Crossing Obama's "red-line" version 1.0 by moving the chemical weapons, in fact, loading them into bombs, is insufficient pretext? I could go on and on but a blind man could see in a minute that if the West wanted to invade Syria, for once, they would not need to fabricate a pretext, and if they wanted to rally public support for such an invasion, all they would have to do is run some of the stuff available on YouTube from Syria on the Evening News. Which brings us to the third reason the Democracy Now claim is ridiculous. 3.) The West has no intention of putting any ground forces into Syria to overthrow Assad although they may try to do so to "shape the outcome" after Assad's forces have been defeated by the revolution. It is not for the lack of a "pretext" that after 22 months of regime violence against the masses, there aren't NATO boots on the ground or even NATO air cover over the neighborhoods. It is because from the beginning, the NATO members have been a closet opposition to the people's "regime change" efforts in Syria. Their view has been "Better the Devil You Know." They have wanted Assad to stay in power; now they see that is no longer possible. That is why they are at long last recognizing the Syrian opposition. Remember how Bush recognized the 2002 coup attempt against President Hugo Chavez in Venezuela the next day, even though they were out the day after that! A lot of people in Syria want for NATO to do what it did in Libya. Other protesters do not. The USG's recent statement said it wouldn't be intervening there a la Libya because the people didn't want it, but we've been plenty of other things from the USG that didn't display any regard for what the Syrian protesters wanted from the West. It's definitely worth being aware if the calls from within Syria for a foreign intervention begin to grow, but there is just no way this will happen. Any foreign intervention in Syria will have far wider implications than the one in Libya. For one thing, the Syrian military is far more capable than the Libyan one, and it has not splintered as yet like the Libyan one did before the intervention. [that was over a year ago - cjc] Second, the Arab street and the Arab league would be far more concerned about an intervention in Syria as that would remove a bastion of opposition toward the Izies. Third, the Syrian opposition against Assad is not as widespread as the one in Libya, and you may very well have around 50% of the Syrians still in favor of Assad. [that was then - cjc] Finally, Syria has weaponized chemical weapons. Anyways I'm not arguing there is about to be a military intervention. I agree with what you have written as that has been our assessment for months now. My point is merely that the US stated intention for not intervening is clearly belied by what the opposition want. Here too, many on the Left also claimed that the protesters in Syria were demanding no international intervention when they clearly were as reported here, here and here. "God, Syria, We want a no-fly zone over it," shouted protesters in the Bab Tadmur neighbourhood of Homs. "A no-fly zone is a legitimate demand for Homs," read banners carried by protesters in the Khalidya neighborhood. That was 14 months and tens of thousands of lives ago. The world has in all this time denied them what they rightfully demanded and the Left has been in the forefront of that denial. As with the West's real policy of giving Assad the time and space to crust the rebellion by any means short of "a whole bunch of chemical weapons" the whole "Hands off Syria" crowd has been providing left cover for what the imperialist had every intention of doing without their advise. MS. NULAND: I think our position on this hasn't changed. As we have said, the vast majority of the Syrian opposition continues to speak in favor of peaceful, nonviolent protest and against foreign intervention of any kind, and particularly foreign military intervention into the situation in Syria, and we respect that. And some 30,000 Syrian deaths later, they still aren't doing anything to stop the slaughter. For almost two years now the Left has been demanding the Imperialists provide no support for the Syrian Revolution, and in this they have been successful. Surprise, Surprise! Here is another popular example of this Left take on the Assad chemical weapons danger. This one is straight out of Moscow Central, i.e. Voice of Russia, but Google shows 3050 results in a search for it. It has gotten very wide distribution in just a few days. Again, this article doesn't talk about what is going on in Syria now. The mass killing being done by the Assad regime becomes an inconvenient truth if you want to claim fears of his chemical weapons are unfounded or fabricated. We are told to be sure that a regime that is doing this to its country would never be crazy enough to use chemical weapons. Assad is in the process of using almost everything he has to kill his people and the more recent use of improvised barrel bombs and naval mines against land targets strongly indicate that he may be running out of deadly agents and this Thielmann guy, who obviously is not in Syria, is here to smugly tell us "there is no threat" that Assad will use chemical weapons. Never mind that Obama has already "made our threats" as to the movement of chemical weapons being a red-line, and Assad has already "called our bluff" on that score. I think Assad is beginning to "expect something pretty nasty" whether he uses his chemical weapons or not so I don't think we can rely on Obama's threats to stop him. I think it is high time the Left stop indulging its cynical fantasies and stand with the people of Syria. For a real world analysis of issues surrounding Syria's chemical weapons we now have a very interesting report acquired by WikiLeaks from the Stratford Global Intelligence files. It is two years old, dated 29 December 2010 and so before the Arab Spring so the question of Syrian chemical weapons against Syrians wasn't on their radar. Hizbullah has not mounted chemical weapons on any of its missiles. All HZ missiles are equipped with traditional warheads. The Iranians supplied HZ with limited quantities of chemicals for use to slow down an Israeli ground offensive. The Syrians insisted that the chemicals go to southern Lebanon, especially to the South Litani area. The Syrians ensured that they would never allow HZ to threaten Israel with chemical warheads on the Syrian-manufactured M-600 (Fateh-110) it supplied HZ with. Syria knows that Israel cannot tolerate such a missile capability for HZ. HZ has stored the chemicals in a variety of locations in southern Lebanon. The July 14, 2009 mysterious explosion in Khirbet Silim in the South Litani area destroyed a chemical weapons depot. HZ has protective gear for chemicals. This further points to the fact that HZ will only use the chemicals it has in tunnel warfare or to slow down the IDF advance. Israel is not believed to have stockpiles of chemical weapons. There are no chemicals mounted on HZ long range missiles. The Syrians believe next war will involve them as well and they believe a determined HZ resistance in the south will slow down the thrust of the IDF advance in Syria's flat terrain between the Golan ceasefire line and the outskirts of Damascus. The Syrians will not be using chemicals against advancing Israeli troops. Although the Syrians have their own stockpiles of chemicals mounted on their M-600 missiles, it is most unlikely that they will ever consider using them. It is known to everybody in the region that their use in the form of missile launches will trigger an intolerable response from Israel. HZ will use its chemicals to slow down the IDF ground advance; chemical canisters will be used locally and never mounted on missiles. Should war break out, the IDF will launch massive air raids and landings by special forces to destroy HZ missile sites, which are equipped with traditional explosives up to 500 kgs on the M-600s. HZ will unleash what remains of its missiles against Israel as soon as the IAF offensive gets underway. HZ has plans for sending guerrilla squads to penetrate into northern Israel. Yes, Iranian experts control HZ arsenal of chemicals and most likely it will be IRGC troops who will launch them at advancing Israeli troops. By the way, HZ arsenal of chemicals is not significant as it does not exceed 300 canisters. Iranian Diplomat: says Iran will certainly not invite an Israeli nuclear by mounting chemicals on HZ missiles. He predicts next war to include Syria as well. He thinks the war will lead to the signing of peace treaties between Syria/israel and Lebanon/Israel. He thinks Syria, Lebanon and Jordan will become a buffer zone between Israel and Iranian sphere of influence in Iraq and the Gulf. Iran will not go to war against Israel over a regional war between Syria/HZ on the one hand and Israel on the other. From this report you can also get a clue as to why the big powers might want to keep Bashar al-Assad around, and not just Russia and China, but also the US, UK, EU and even Israel. In spite of his "anti-imperialist" facade, Assad was somebody they could deal with. He bought a certain kind of brutal stability to the region. He might use Hamas and Hezbullah as bargaining chips but he could be depended upon to keep the Palestinians, Lebanese and his own people in check. The Left can go on forever looking for "regime change" plots behind the Arab uprising, but the movement to "rock this boat" did not come from the West, it came from the people of Syria. If the US thought North Korea was unloading nuclear technology in Syria, there is no way Bush would decide not to act so it didn't undermine the talks with DPRK. A North Korean nuclear program is already a done deal. A syrian one is not. Maybe it was a chem weapons plant (though it is intreesting how little play the reports of a chem weapons accident from July got, even though it was supposidly them loading the chem warheads onto the medium-range missiles). Missiles possibly (remember, it was supposidly a North Korean cement ship unloading - and it was a cement ship that was carrying missile parts to Yemen a few years ago) - but then why have to hit it right away? I am thinking more and more that the whole North Korea angle is a red herring, designed to misdirect so no one can figure out what really happened. There was a recent report of an explosion in Syria where Syrian and Iranian chemical weapons experts were killed. Is there any possibility that the Iranians or Syrians believe that Israel or US Special Forces were involved in that explosion, as well? Because if there is, then the game may be about the Syrians and Iranians trying to figure out where the mole is or where their network has been penetrated. With two successful weapons related operations occurring in quick succession inside Syria, one which could be tied to NK, but might not be ... and the other which could have been an accident, but might not be; you can see how one in Iran might presume that their network supporting operations in Syria had been penetrated ... or compromised in some way. It seems to me that grayness in these matters often has a value ... and the US and Israel may be hoping to exploit it. One other thought ... is there any chance all this could be the real root cause behind the Iranian border closing? And if so, what exactly are the Iranians cooking up in Syria? Was all this destined for Lebanon ... or for Baghdad ... or for somewhere else? Do we, in fact, have their plans ... or have we just been lucky? To take it a step further, the Iranians could be shutting down the system in order to check it for leaks and gaps, slowing progress toward their goal - and putting forces in Iran and Syria that are friendly to the US and/or Israel at great risk. This is how the international game has been played through the cold war and long before. The masses played no part in their plans. The masses didn't even fit into their equations. The Arab Spring has changed all that.